I was just about out of ideas for breakfast foods that Nolan will eat. He usually just wants bacon and a chocolate hazelnut Zing bar, but he is starting to tire of bacon, and that specific bar is so popular that sometimes it is out of stock at the store. I’ve been making all sorts of protein-rich grain-free muffins and pancakes (and even cookies) sprinkled with chocolate chips in the hopes of piquing Nolan’s interest, but he has been rejecting them uniformly. He won’t touch eggs or smoothies right now, and breakfast sausage is really hit-or-miss. 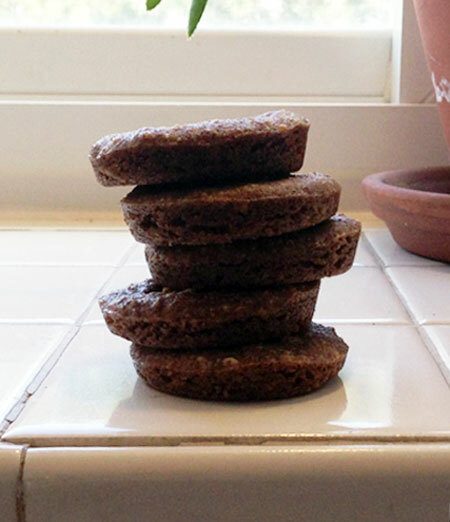 Then I came across this recipe for grain-free flax breakfast cookies, described as being crispy outside and chewy in the middle. Nolan still loves flax crackers, so I thought this simple recipe would be worth giving a try, and I doctored a few just for him with chocolate chips. These cookies have just 4 basic ingredients, so it takes 2 minutes flat to mix up the batter, and I can easily see these becoming a template for a huge variety of flavor and nutrient combinations, both for breakfast, dessert, and any occasion in between. I used coarsely ground almond butter from Natural Grocers, and appreciated the bit of texture it lent to the cookies. Next time I make these specifically for breakfast, I will likely soak the flax and nut butter with raw milk overnight, and add less maple syrup, perhaps 1/4 cup. To make these nut-free, use sunbutter or tahini in place of almond butter. Preheat the oven to 325°F and prepare a muffin tin with silicone liners. In a small mixing bowl, stir together ground flax seeds, almond butter, maple syrup, and milk, vanilla and cinnamon until well combined. Stir in raisins until just combined. Evenly divide batter into prepared muffin cups in 2-tablespoon portions. Store the cooled cookies in an airtight container at room temperature for up to 5 days. Or wrap them in plastic wrap, then foil, completely enclosing them, and freeze for up to 6 months. Let thaw at room temperature for 2 to 3 hours before serving. Source: Slightly adapted from Power Hungry.